It was December 14th, 2012. Friday at the end of a long week. On Monday there was a brutal murder just a few houses down the street from my office. That put me in a thoughtful frame of mind about life. Then Tuesday happened. A solitary gunman entered the Clackamas Town Center, a huge mall just 5 minutes from my home, and sprayed bullets into the food court. Two died. I thought the week couldn’t possibly get worse. Friday morning I was sitting at Panera Bread, getting my thoughts in order for my weekend presentation at Bridge City. I turned on my computer to do some research, and time slowed to a stop. The Newtown, Connecticut massacre was happening in real time in front of me. 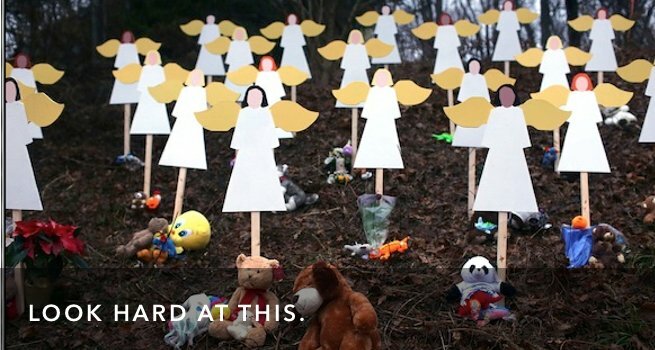 Twitter, Facebook, a number of news websites transported me to the street outside Sandy Hook elementary school in Newtown, standing there with terrified parents, waiting for each new bit of news. Hoping, fearing, horrified. I tried over and over again to gather myself and press forward with the work I had to do. But I couldn’t. I don’t think I made it more than 15 minutes the whole day without breaking down and weeping. I have a daughter. She was 6 at the time. I drop her off most mornings at her elementary school. It’s not uncommon for me to tear up just a little bit watching this tiny girl hidden behind her enormous backpack as she runs into the building. I worry about the big world I’m sending her off into. The thought that I could drop her off one morning and never see her again… I’m sick to my stomach even typing that sentence. As a nation we’re entering into the time of reflection that follows such tragedies. Our gut instinct is to solve the problem. That’s what anger motivates in us. We feel a drive to stand up, to make changes so this sort of thing can never happen again. Suggestions and questions turn into demands. Agendas rise to the surface, as our anger and horror drive us to make sense of the chaos. It’s already happening. More gun control will stop this sort of thing, say some. Their opponents shout them down and say just the opposite is true. What Newtown needed was more access to guns so that the innocent could protect themselves. The solutions spread out like wildfire across the spectrum of our lives. Better schooling will do the trick. More prayer in schools! We need stronger mental health care. We need more psychoactive medications. Or less! Maybe it’s the meds that caused it. I even saw one person online post a detailed rant about how this tragedy was caused by our terrible diet, and how a whole-food diet without GMOs would be our salvation. I get the desire to find a solution. This is so terrible; it’s not tolerable. Something must change. But to my ears all of this sounds like piling bandaid upon bandaid to stop a heart attack in progress. We’re desperate for peace, but not one of these solutions can bring it. The human heart is broken and a bandaid won’t mend it. There can be no peace in the world until there is peace in the human heart. Tweet that! This event has confirmed for me how vital the work of spiritual transformation is. This is why I follow Jesus. This is why I serve at Bridge City Community Church. This is why I go on and on and on with the people there about a changed heart and how we can live from the inside-out. This is why I write, why this blog exists. This is why the 210 Life matters. We cannot save ourselves. We cannot self-help ourselves into wholeness. We can’t educate or legislate or manipulate the world around us into being a safe place. The one and only solution for the terrible brokenness in this world is the resurrection of Jesus and His work to restore us all to God. Peace with God leads to peace with self, no longer alienated and afraid. Peace with God leads to peace with neighbor, no longer needing to dominate or manipulate or over-power. Peace with God leads to peace between tribes and nations, as we discover that we are all God’s children, called to join Him in a new kind of family. A new heaven and a new earth; that’s what God has been building silently, one heart at a time. I believe this mission won’t truly be complete until Jesus returns (Yea… I’m old school that way.) But I also believe that we have a role to play now, today. This isn’t pie-in-the-sky-after-you-die stuff. This matters for every moment of every day. We’ve been given an opportunity to participate in the Divine project, bringing to life the Kingdom of God. 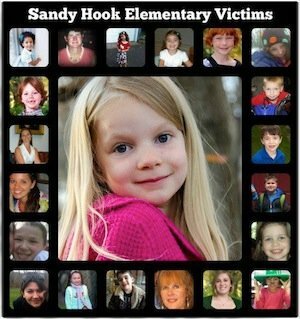 And so, the question on the table following these tragedies is not how much gun control so we need. The question on the table is this: Will I pour my best efforts into God’s work to change the human heart? I think this is the question for you as well. I write and speak. You may not. But whatever you do, will you do it so that hearts can change? Will you give your very best to whatever your calling, so that grace and love and truth can have their way? Will you choose integrity and compassion over self-advancement and self-protection? Your life is a beautiful piece of art, handcrafted by the Divine Artist, with the intention that you would bring good and beautiful things into this world. (More on this here.) This isn’t just a nice idea to make your heart happy. This is a critical, vital calling, one the world is desperate for you to start living. Desperate. As for me, I will let the names and faces of the Newtown’s dead remind me that every single moment is a gift and I have a responsibility to use those moments well. I will write and speak and build relationships and point towards hope with all my might, because that is how I can be a part of the transformation of hearts. There are no throw-away moments, no days to waste. I will be a part of bringing peace to the human heart. But what about you? How will this week of tragedy impact your life? Will it make you smaller, more self-focused, more afraid? Or will you take courage and become one of the peace-bringers? Think of those whose lives ended so unfairly, so unexpectedly in Newtown this past week. Then ask yourself this: How will you spend your only precious life? Note: If you’re struggling with the impact of this tragedy, I preached on the topic this at Bridge City Community Church. Perhaps this can be encouraging to you or someone you know.